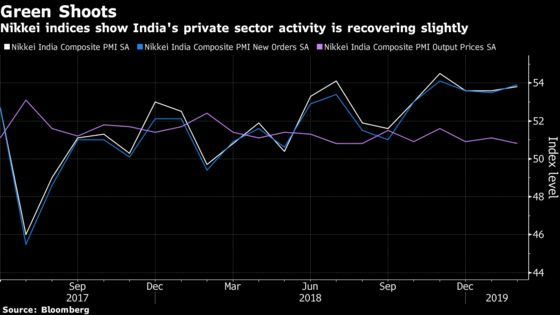 (Bloomberg) -- India’s economy showed conflicting signs of a recovery in a climate clouded by uncertainty ahead of a general election beginning next month. Overall activity in February picked up slightly from the previous month, according to a slew of high-frequency indicators compiled by Bloomberg News to measure ‘animal spirits’ -- a term coined by British economist John Maynard Keynes to refer to investors’ confidence in taking action. However, subdued exports growth, a sharp drop in imports and waning output prices signaled the economy is performing below its potential. 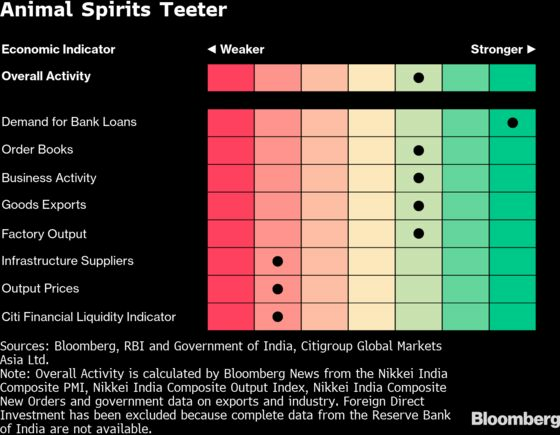 Teetering economic activity will give the central bank’s Monetary Policy Committee, headed by Governor Shaktikanta Das, a reason to deliver on expectations for a back-to-back interest rate cut in April. The panel lowered rates in February in the face of subdued inflation and flagging investments, and data since then suggests Asia’s third-largest economy could do with some more stimulus. Economic growth slowed to 6.6 percent in the quarter to December as political uncertainty ahead of a national vote in April and May compounded challenges posed by weak domestic demand and a global slowdown. The seasonally adjusted Nikkei India Composite PMI Index edged up to 53.8 in February from 53.6 in January. The upturn in new work for the services sector was domestically driven, and so was activity in manufacturing. Inflationary pressures were subdued, with the rate of price gains for the services sector softening to a level below the average of the survey’s near 13-1/2 year history. 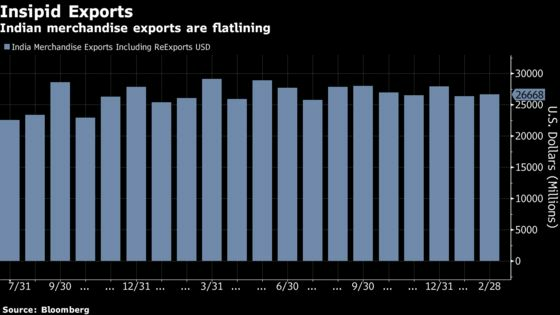 Exports growth was tardy, slowing to 2.4 percent year-on-year in February from 3.7 percent in January, while the 5.4 percent drop in imports was the worst since August 2016. Consumer demand remained sluggish, with auto sales declining from a year ago. Sridhar V, a partner at Grant Thornton India LLP, attributed this to higher costs of loans, slowing industrial output and moderate economic activity ahead of the elections. The severity of the slowdown may have prompted the Indian unit of Suzuki Motor Corp. to cut production in March, the Business Standard newspaper reported Monday. A spokesperson for the company declined to comment on the matter, the newspaper said. 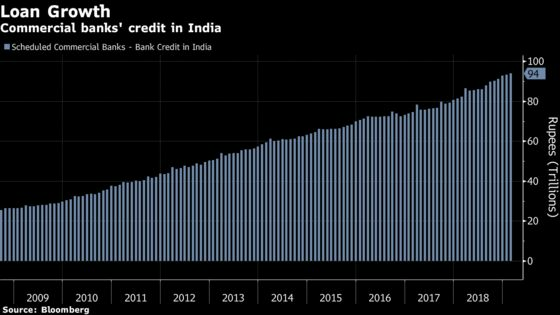 Demand for bank loans grew at 14.4 percent in February from a year ago, although slowing slightly from levels seen in January, according to Reserve Bank of India data. The Citi India Financial Conditions Index, a liquidity indicator, showed a slight drop in February, with overall conditions pretty tight, thus undermining consumption. Growth in India’s core infrastructure sector, which constitutes 40 percent of total industrial production, slowed to a 19-month low of 1.8 percent in January as electricity generation and production of refinery products contracted. As a result, industrial production slowed too. The index rose 1.7 percent in January from a year earlier with capital goods output contracting 3.2 percent from a year earlier. Data for both indicators are reported with a one-month lag.